Lindsay Fritch is amazing to work with. She is very talented and knew exactly what I wanted and made it happen. I had over 350 people at my wedding and got amazing responses from a good amount of the people. I would recommend her services to anyone for any of their needs. Lindsay was fantastic to work with. She was professional, responsive, and extremely creative. We gave her design ideas and she ran with them giving us the ideal results. I would use her again in a heart beat and recommend her to any bride. Lindsay made our invitations and programs. We were really happy with the result. She was very easy to work with. I didn't have a complete vision of what I wanted but she was able to work with me to come up with a creative look. She was also very good at working within our budget! I can hardly begin to express how grateful I am to have Lindsay and the Green Loft to help me with my wedding stationary. 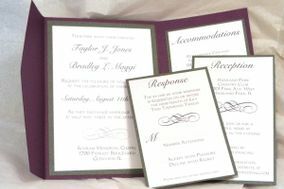 I was initially planning on designing and assembling my own wedding programs, table cards, etc. and when I realized what an undertaking it was I started to look around. I went to several stationary stores and realized that what I wanted did not exist. I reached out to Lindsay who I knew was involved in personalized stationary. I met with her at a nearby Starbucks and explained what I was looking for with our wedding invitations. We discussed price, picked colors, textures, fonts, EVERYTHING! She ended up doing our invites (pockets with three inserts and response envelopes), programs, menu cards, table numbers, and our awesome place cards that were the size of our photobooth strip (we placed these in plastic frames and used them to display the table assignments and also serve as the guests wedding favor for their photobooth strips). EVERYTHING WAS CUSTOM (and may I add very reasonably priced)! I really felt that we worked on everything together as part of a team. My fiance and I were provided with several examples to show color, text, etc and were able to pick which one to move forward with. Communication was great and everything was just perfect from the execution to the packaging. I will definitely be using The Green Loft again for any future stationary needs. I can not thank you enough!